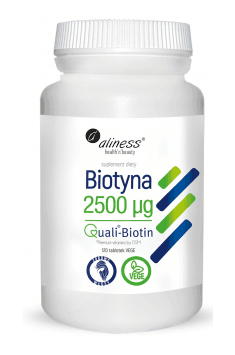 Aliness Biotin is a dietary supplement containing the patented form of biotin – Quali-Biotin® produced in Europe. The product strengthens hair and nails (prevents them from breaking and restores elasticity) and ensures healthy-looking skin. The preparation contains D-biotin, a biologically active form of biotin. Biotin (vitamin B7) is called a vitamin of beauty or less often a vitamin H (Haut means "skin" in German) and, like other B vitamins, it plays an important role in the functioning of the body. Biotin is mainly known for its beneficial effects on hair, skin and nails, but as it turns out, it has a much wider application. Biotin may bind to other proteins in the process called biotinylation, through which it allows for the proper functioning of some enzymes. This process is the essence of biotin activity because many biotin-dependant enzymes are necessary for the proper course of gluconeogenesis, lipid metabolism, amino acid catabolism, and a series of energy transformations. Biotin also participates in gene transcription and may be important in regulating chromatin structure and in DNA repair. Deficiencies of this vitamin affect, among others, people with congenital disorders of biotin metabolism (e.g. biotinidase deficiency), problems with digestion and absorption, individuals on long-term parenteral nutrition or those consuming large amounts of raw egg protein. Although biotin deficiency is relatively rare, it is worth supplementing it, especially if the skin, hair or nails need support from the inside. Biotin is often a relief for weakened hair and nails. It has been shown that a regular, several-month biotin supplementation at a dose of 2.5 mg per day is extremely effective in case of the problems with nail plate. Biotin supplementation resulted in the reduction of brittleness, fragility and splitting of nails. At the same time, the condition of the hair was improved - it became stronger, more flexible and shiny, and their loss was reduced. The beneficial effect of biotin on the appearance of hair and nails is conditioned by the presence of sulfur molecules. Sulfur is part of keratin, which is a family of structural proteins that is characterized by high mechanical and chemical resistance. Keratin builds structures such as hair and nails and has a strengthening function, making them more resistant to external factors. Biotin deficiency may result in the appearance of lesions located within the skin. These may include seborrhea, dryness, psoriatic and erythematous changes, and even hyperchromia. Their occurrence is probably caused by disorders in the metabolism of lipids that biotin is, too, responsible for. Biotin supports the processes of skin cell differentiation and regulates the activity of sebaceous glands. Supplementation with biotin may improve the elimination of inflammation and support the treatment of even severe conditions of seborrheic dermatitis. In addition, biotin has moisturizing, brightening, and smoothing properties so it can effectively reduce the symptoms of aging. People with dry skin, prone to wrinkles will particularly benefit from the supplementation with biotin. In summary, Aliness Biotin is a dietary supplement that strengthens the structure of hair and nails and has a positive effect on the skin condition. It is recommended especially for people struggling with excessive hair loss and fragile, brittle nails. It is also perfect as an internal supplement of care among people who expose their hair to frequent hairdressing procedures. One possible reason for the insufficient level of biotin in the body is the high intake of raw egg protein. It is the source of avidin - a substance that forms a complex with biotin and prevents its use. However, this may be prevented by subjection of the egg to heat treatment (in which avidin denatures, or decomposes). Although egg yolk contains no significant amounts of avidin, it is a source of other proteins with high affinity to biotin, therefore people exposed to a deficiency of biotin are advised to cook whole eggs before consumption. To achieve visible results, regular biotin supplementation should last about 3-6 months. This is due to the growth rate of hair and nails. Only after this time, they will grow to such length that allow them to be assessed. Bulking agent: calcium phosphates, microcrystalline cellulose, acacia fiber (FIBREGUM™), anti-caking agent: silicon dioxide.